Viosoft Corporation, a pioneer of fully integrated embedded software solutions, announces the availability of the next generation of their award winning Arriba for Android development platform. The Arriba for Android environment fully enables the creation / porting of high performance applications for the Google Android software platform for the newest multiple core devices regardless of the architecture or connectivity option. To underscore this point, Viosoft will demonstrate at the Design West event this week the ability of Arriba to debug the AMD G-Series based platform over a wireless connection. Viosoft Corporation, a pioneer of fully integrated embedded software solutions, announces the availability of the next generation of their award winning Arriba for Android development platform. The Arriba for Android environment fully enables the creation / porting of high performance applications for the Google Android software platform for the newest multiple core devices regardless of the architecture. To underscore this point, Viosoft will demonstrate at the Design West event this week the ability of Arriba to debug the AMD G-Series based platform over a wireless connection. Arriba for Android is fully integrated with the Google Native Development Kit (NDK) and the Google Application Development Kit (SDK), to provide a complete source-aware run-mode debug control of the entire Android platform through a single IP connection to the target. 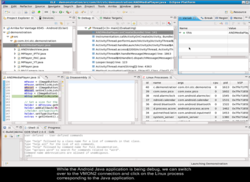 From the Android enabled SMP Linux kernel through the Dalvik VM, Arriba provides unprecedented visibility into code development that extends the standard capabilities provided by the Google Android SDK. Arriba for Android features an enhanced Eclipse environment with a comprehensive set of plug-in modules that offer valuable insight and unprecedented access and control of the Android software under development. Wireless remote run mode debug. End-to-end source aware debug coverage from SMP Linux kernel to Android high performance application. Multilingual C/C++ and Java development. Non-preemptive debugging of kernel, drivers, middleware and application for the Android on both simulator and hardware platforms. Multi-core awareness with thread level control. This solution is immediately available from Viosoft. For pricing information, contact sales(at)viosoft(dot)com. Viosoft is a pioneer provider of fully integrated embedded software solutions. Founded in 1997, Viosoft is based in San Jose, CA, and has its sales organization located in Boston, MA and Austin, TX. Viosoft is an active, early member of the Open Embedded Software Foundation (OESF) and is engaged with its members to enable the deployment of Android in both mobile and non-mobile markets.